The use of porcelain crowns (also known as porcelain-fused-to-metal crown or PFM crown for short) is recommended for treating extended tooth decay or chipping. Despite the pain it causes and the possible discoloration, the tooth is usually salvageable in these cases, therefore the porcelain crown is a perfect solution for its restoration. Below, you will find all the details about porcelain crowns and information about the steps of the treatment. 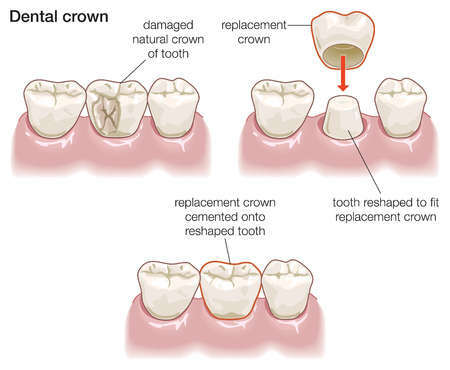 Crowns are dental restorations used to replace damaged teeth. Crowns are placed onto the remaining teeth above the gumline, but they can also be placed onto implants. They can be shaped and coloured to fit in perfectly with the patient’s natural teeth. Dental crowns also protect devitalized teeth from further damage. Crowns can be used for aesthetic reasons too, in order to correct discoloured, misshapen teeth. After the patient is numbed, the first step is the preparation and reduction of the tooth. The dentist takes an impression of the abutment and the surrounding teeth. Until the porcelain crown is prepared, a temporary crown is placed onto the tooth. The porcelain crown is prepared within a couple of days in our laboratory with CAD-CAM technology. The dentist applies the porcelain crown onto the abutment and fixes it with a special dental cement. When is a dental post necessary? The dental posts are recommended when a big part of the natural crown is missing and basically only the roots of the tooth remain, because in this case there is not enough natural tooth to form the abutment and support the porcelain crown. If the root canals of the tooth are in bad condition, the tooth probably has to be removed and an implant or a bridge is needed to replace the missing tooth. However, in many cases the dental post can be a perfect solution as the post provides support for the porcelain crown. In order to choose the best treatment, a panoramic x-ray is needed. Based on this, the dentist is able to determine the state of the root canals and whether the placement of a root pin is possible. The prerequisite of the placement of a root pin is the devitalization of the tooth. The dentist places the root pin into the root canal, and – in case of a freshly devitalized tooth a couple of days later – takes an impression. The cast is sent to the laboratory where the porcelain crown is prepared. The crown is fixed onto the pin with a special dental cement. Thanks to the outer porcelain layer, the colour of the crown will match perfectly the surrounding, natural teeth. The base of the crowns is made of metal under porcelain finish, which makes them extremely strong and durable. For patients with metal allergies, zirconia crowns might be an alternative. The porcelain crowns are made by a special, computerized CAD-CAM system. The process is almost entirely automatized, assuring excellent quality and minimal waiting time. In our laboratory, we only use high-quality materials for the porcelain crowns. For patients with bruxism, grinding their teeth puts extra pressure on their teeth, however this is not a contraindication. Porcelain crowns are made of strong material that can handle the additional pressure of teeth grinding. In some cases, the dentist can recommend using a mouthguard or nightguard to protect the teeth.